Sustenance, traditionally called the Empress, helps to sustain and nurture her family, her community, and herself. She is confident in her abilities as a leader and in her intellect and skills to strengthen those in her sphere. She has a deep commitment to the welfare of nature and the earth as well as people. Sustenance is abundant in all ways. She does not want for anything and is generous in what she gives to help empower others. Sustenance has a deep connection with the feminine. Femininity appears in many ways – as beauty, sensuality, fertility, creative expression, and nurturing. The attributes of Sustenance are necessary to create balance in both men and women. 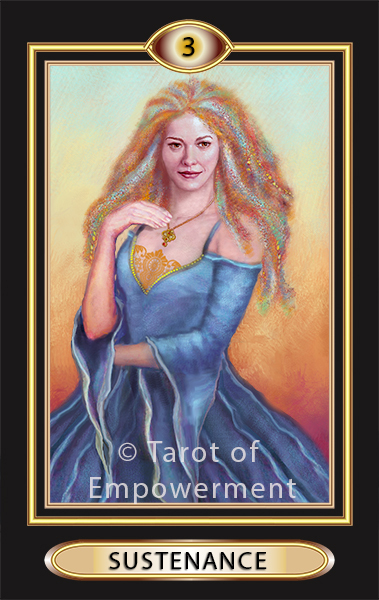 In Tarot of Empowerment, Sustenance is depicted by a confident woman looking straight into the lens of life. She is present and available to those who call upon her council. She teaches love, compassion and compromise. Sustenance thrives on her relationships with children, men as well as women, and Mother Earth. Upright: When Sustenance comes up for you in a reading, you are being called upon to embrace those around you with love, compassion and nurturing. You are pregnant with possibilities and opportunities. You can move forward with confidence, knowing that this is the time for you to give birth to, and to nurture, a wonderful situation, be it for yourself or your world. Empowerment: You are empowered when you use your words and skills as tools to strengthen worthy causes and people around you. Reversed: Sustenance reversed suggests that you may be depleted and need to replenish yourself. You cannot sustain others if you do not take care of yourself. As a block, pause to ensure you are not nurturing a person or project to the point that you are making creating dependency on you. Dependency is not empowering. Numerology: Sustenance is associated with the number 3, which implies an excellent communicator and creative person, someone who is generally optimistic. Cards that reduce to 3 are New Perspective (12) and the World (21).